Drobo, founded in 2005 as Data Robotics, had one primary goal: make redundant external storage simple for average consumers. The company took its first steps to meet this goal in 2007 when it launched the first-generation Drobo, a four-drive device that could protect the data stored within from a single drive failure. There were admittedly some shortcomings to that first product. The device’s first-generation processor, that handled the propriety data storage and redundancy calculations, was relatively slow. On top of that, only a USB 2.0 port was available for connection to a single Mac or PC. 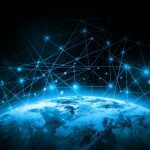 Since then, the company has greatly expanded its product line, with devices targeted to both consumers and businesses. 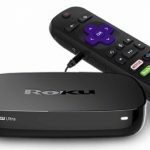 New connectivity options were added, including FireWire 800 and eSATA for direct-connection products, and gigabit Ethernet ports for new NAS (network attached storage) devices. 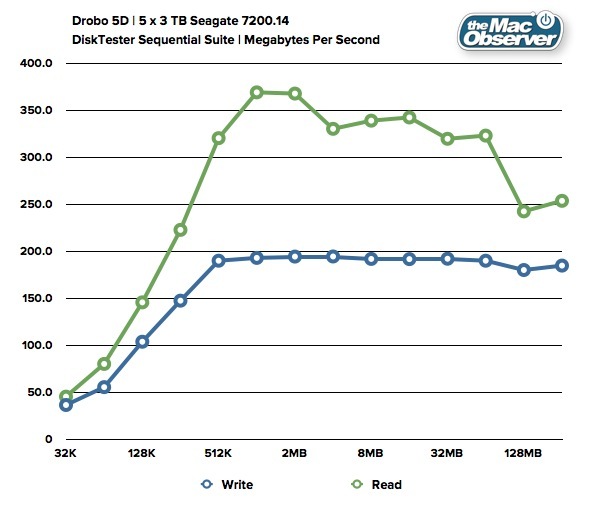 In addition, with each generation of Drobo, the internal processor evolved to be faster and more efficient. Recently, and after much anticipation, Drobo released its first Thunderbolt-compatible device, the Drobo 5D. Sporting five drive bays, two Thunderbolt ports, and a USB 3.0 port, the 5D promised to be the company’s fastest consumer product yet. To find out if real-world performance matched the hype, we spent some time putting a 5D through its paces. Put simply, all Drobo products offer redundant external storage in an arrangement that intelligently spreads data over multiple drives so that the data is protected in the event of a single drive failure (some Drobos, including the 5D, can also be configured to protect against two simultaneous drive failures at the expense of total available capacity). Those familiar with external storage will instantly recognize that what Drobo offers is very similar to a RAID (redundant array of independent disks). There are many different types of RAID configurations, but the one closest to what Drobo offers is RAID 5. Unlike a RAID 5, however, Drobo does not require that all disks be the same size or, for some RAID configurations, from the same manufacturer. Drobo allows a user to combine nearly any size or type drive and intelligently expands capacity and protection to compensate. As a result, a Drobo user can start off with any available set of drives and either add drives or replace existing drives with those of a larger capacity at a later date. This advantage over traditional RAID is why Drobo refers to its technology as “BeyondRAID.” Those curious about how much usable space the stack of drives on their desk will provide when used with a Drobo can check out the Drobo Capacity Calculator. The Drobo 5D adds Thunderbolt to the company’s product line for the first time. USB 3.0 is also available, but was previously introduced with the second-generation Drobo S in late 2010. The 5D also introduces an mSATA port that can optionally house an SSD for the purpose of Data-Aware Tiering, a feature that was heretofore only available on the company’s more expensive business-class devices. In theory, data-aware tiering can significantly improve the speed of certain reads and writes by intelligently moving data between the SSD and HDDs as needed, particularly when dealing with small random read and write operations. We’ll reveal later on in our benchmarks exactly how well it works. Due to the fact that the 5D, by its very nature, writes lots of data between the SSD and the internal HDDs, Drobo included a battery in the unit that keeps the drive alive long enough in the event of a power failure so that it can complete any cached writes. Losing power during any write is an easy way to corrupt data, so the battery feature is a welcomed level of protection. In our testing, we began copying a folder of 1,163 files of various sizes to the Drobo. We then yanked the 5D's power cord from the wall to simulate a power outage. The Drobo stayed powered by the battery for about 20 seconds before gracefully shutting down. When we plugged the unit back in and rebooted, the data on the drive was still intact and none of the files that had been copied before the power loss were corrupted. Inside the box, the 5D comes nicely packed in a cloth bag beneath a separate container housing the power cord and instruction guides. Unlike many Thunderbolt products, the 5D includes a 2 meter Thunderbolt cable. With the current prices for Thunderbolt cables hovering around US$50, the inclusion of the sophisticated cable is a smart move on Drobo’s part and allows a new user to get started with the unit right away. Also included in the box is a far more ubiquitous, but still appreciated, USB 3.0 cable. Another benefit of the Drobo over a RAID 5 array, discussed above, is the initial setup. Simply insert bare 3.5-inch drives into each drive bay – the drives go in “naked;” there are no trays or caddies to attach – install the included Drobo Dashboard management and monitoring software on your computer, connect the device to power and attach it to your Mac or PC using the Thunderbolt or USB 3.0 cables (of note, even though some PC motherboards now include Thunderbolt ports, Thunderbolt support for the 5D is currently limited to Macs). Once the unit boots up (which can take a minute or two; watch the blue lights on the front of the 5D fill up from left to right to gauge the boot up process) the Drobo Dashboard software will ask you to create a new volume, which will represent the total capacity of the Drobo as a single drive on your computer. Because Drobo has the ability to grow as more or larger drives are added over time, it’s a good idea to create a volume that is as large as possible (a value that is currently limited to 16 TB). This way, as you max out the capacity of the Drobo, your computer will continue to see a single logical drive. If you set a smaller volume size but then later increase the capacity of your Drobo beyond that limit, an additional logical volume will be created with the remaining capacity. Once you’ve made you size and formatting selections, the drive is ready for use. It will appear on your desktop as a single drive with the total capacity you chose above. Keep in mind, however, that this is likely not a true representation of the drive’s current available free space (unless your maximum volume selection matches the actual capacity of the drives currently installed). To determine true capacity, you’ll need to use the Drobo Dashboard software. This can be mildly annoying, but it’s a necessary price for the nondestructive expansion options that the Drobo offers. I’ve owned or used every consumer-targeted Drobo since the first model and while I’ve come to enjoy the flexibility that Drobo offers, I’ve always been disappointed with the performance. Compared to similarly-configured RAID devices using identical interfaces, my Drobos often seem to be slightly, but noticeably, slower in both reads and writes. After spending some time with the 5D, however, I am happy to report that it is the fastest consumer-targeted Drobo yet. We connected the Drobo via Thunderbolt to a 2011 27-inch iMac with a 3.4 GHz i7 and 32 GB of RAM. We then loaded the unit up with five 3 TB Seagate 7200 RPM hard drives. When configured for single disk redundancy, this configuration gave us a Drobo with just under 11 TB of usable space. First, we wanted to gauge sequential reads and writes. Using Blackmagic’s Disk Speed Test we ran five tests with a 5 GB test size. When the first Drobo was released in 2007 and SSDs were still not widely available to consumers, speeds like those above would have been jaw-dropping. Today, with single disk SSDs on a SATA III connection registering over 500 MB/s in transfers, the 5D’s speeds are less astounding. What is amazing, however, is that these speeds, which most consumers would still find to be blazingly fast, are coming from a single 11 TB volume with internal data redundancy. To break down read and write performance, we’ll use the excellent DiskTester, part of the diglloydTools package from Lloyd Chambers, which measures sequential read and write performance with different sample sizes. Writes are clearly consistent, hitting about 200 MB/s at 512K transfer sizes and holding roughly steady throughout. Reads are a bit more erratic, jumping to about 370 MB/s with 1 MB transfer sizes, but then falling with larger sample sizes as the internal processor works to divide and protect the data on multiple drives. Still, the performance seen here with traditional hard drives is significantly improved over previous versions of Drobo devices. 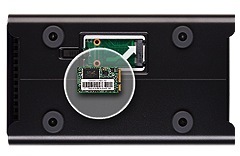 As mentioned above, one of the key features of the 5D is the inclusion of an optional mSATA port for connecting an SSD. The SSD does not add to the total capacity of the Drobo, and you cannot access it directly via OS X or the Drobo Dashboard interface. Instead, the Drobo itself manages the space on the SSD and uses it to intelligently cache files that are frequently accessed or that would greatly benefit from the I/O performance of an SSD, namely small random operations. We installed a 64 GB Crucial mSATA SSD and ran some additional benchmarks to determine the performance increase offered by this new feature. First, let’s look again at the sequential tests we performed above. Theoretically, these results should not be significantly impacted by the usage of the SSD cache, but we were curious to test that theory. The results, as you can see, are intriguing. 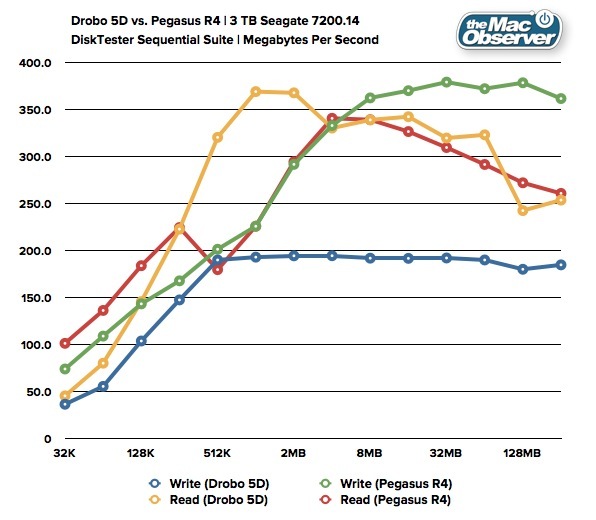 With the SSD installed, sequential reads and writes were actually slower across most of the sample sizes. 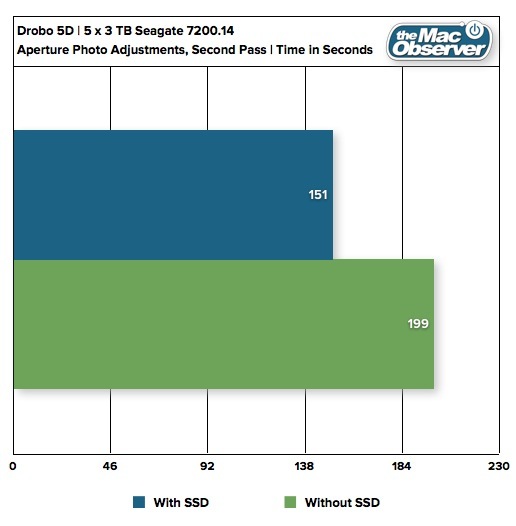 We presume that the decrease in performance is due to the Drobo’s attempt to move data between the SSD and HDDs, and that the extra processing required by the device’s data protection technology causes an initial slowdown, especially with large sequential writes. But large sequential operations are not the whole story. In most use cases, smaller random operations will play a large and important role. To measure the SSD’s impact on these types of operations, we used a compressed file containing 32,768 4K files. After copying the file to the Drobo, we unzipped it to another directory on the device. Here, we see the first benefit of the SSD. 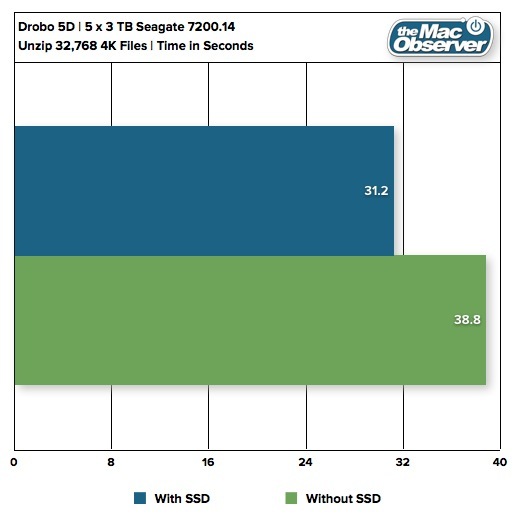 The many thousand small files were placed into the SSD cache by the Drobo’s software, increasing the speed at which they could be uncompressed. The result is about a 20 percent decrease in the time required to perform the operation. 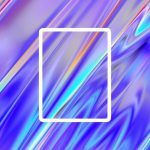 Let’s turn to a more real-world example: photo editing. Using Apple’s Aperture photo editing and management application, we imported 100 RAW images, each about 20 MB in size. We then timed how long it would take to apply the same set of adjustments to each photo using a script. The adjustments, in order of application: Auto White Balance, Auto Exposure, Increase Contrast, Bump Shadows, Convert to Black & White, Sharpen, and Vignette. With the second pass of adjustments both times decreased. 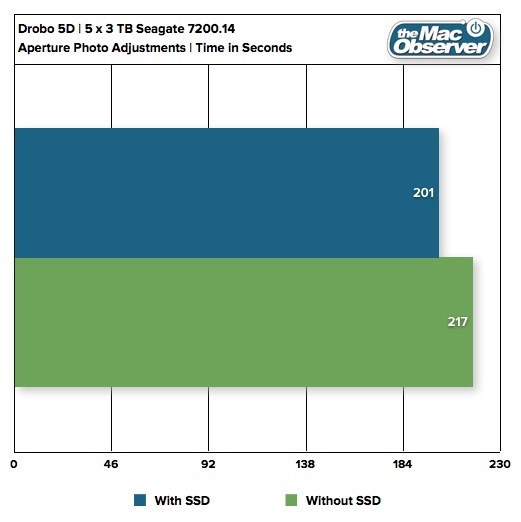 The non-SSD configuration saw a reduction in processing time due to the inherent ability of OS X to cache recently accessed files, but the SSD configuration, with the same benefit, saw a greater reduction in time thanks to its increased performance. The Drobo software knew that we had recently accessed those 100 images, and thus they were still accessible via the SSD cache when we performed our second set of adjustments. In this case, it saved 48 seconds, or about 27.5 percent. The mSATA SSD found in the 5D does indeed help increase performance in certain situations, but those situations are clearly defined. Only users with plans to perform many smaller random operations will see a great benefit from the addition of an SSD; users planning to use the Drobo to store large data files, such as videos or even music for general playback, do not need to rush to purchase an mSATA SSD. Thankfully, the SSD shares the easy expandability of the standard hard drives and users can always nondestructively add an SSD at a later date. For Mac users, Thunderbolt is the preferred interface for connecting the 5D. With the exception of a Mac Pro and a USB 3.0 PCI Express card, every Mac that has USB 3.0 also has at least one Thunderbolt port. For potential 5D owners looking to use the device via a PC, however, USB 3.0 is currently the only option. The maximum sequential speeds measured earlier in the review are well below the 5 Gb/s maximum bandwidth for the USB 3.0 specification. We therefore anticipated very little difference in performance between a Thunderbolt connection and a USB 3.0 connection. To see if our assumption was correct, we connected the Drobo using USB 3.0 to a 2012 15-inch Retina MacBook Pro with a 2.7 GHz i7 CPU and 16 GB of RAM. Surprisingly, the USB 3.0 interface delivered significantly slower performance than Thunderbolt. Reads topped out around 120 MB/s, while writes were stuck at a decidedly USB 2.0-like 60 MB/s. To verify that these results were correct, we ran the test again with a different USB 3.0 cable but noticed no change. Additionally, we tested another USB 3.0 device to ensure that our Mac's USB ports were functioning correctly, but that device performed as expected. A USB 3.0 connection with the 5D will definitely work, and is fast enough for general data storage, but the preferred connectivity method is obviously Thunderbolt. As discussed above, Drobo’s BeyondRAID technology allows for far more convenience and ease of use than a traditional RAID 5 setup, but at the cost of some performance. To determine exactly how much of a performance hit users can expect when comparing the 5D to a RAID array, we decided to run a comparison analysis. 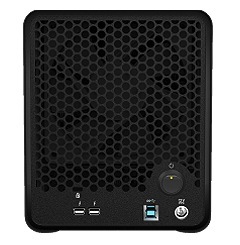 There are many RAID options available, but we chose the Promise Pegasus R4, a 4-bay Thunderbolt RAID device. Using the same 3 TB Seagate hard drives that we used in the Drobo, we configured the R4 for a RAID 5 volume. Readers should note that this comparison is not apples-to-apples; the Drobo has 5 bays to the R4’s 4 bays. Still, we had no access to a 5-bay Thunderbolt RAID device so the following comparison is for general interest only. 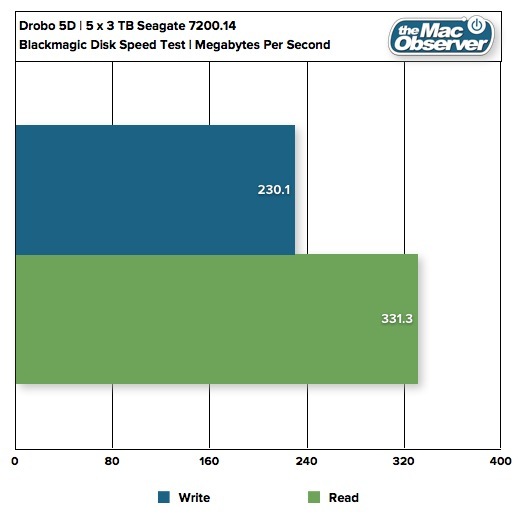 The Drobo 5D performs significantly better with smaller sample size reads of up to about 2 MB, but the R4 scores much better in all other areas, including huge improvements in write speeds above 1 MB sample sizes. This increase in performance may be worth it for some users, but the lack of an SSD cache option, the requirement to use all drives of the same size, and the inability to nondestructively increase capacity by adding or replacing drives are all marks against a RAID device like the R4. The Drobo 5D is indeed the fastest consumer-level Drobo yet. 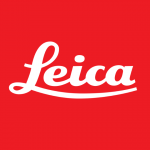 While the price is high, the versatility and ease of use give the 5D a definite edge among its competitors. 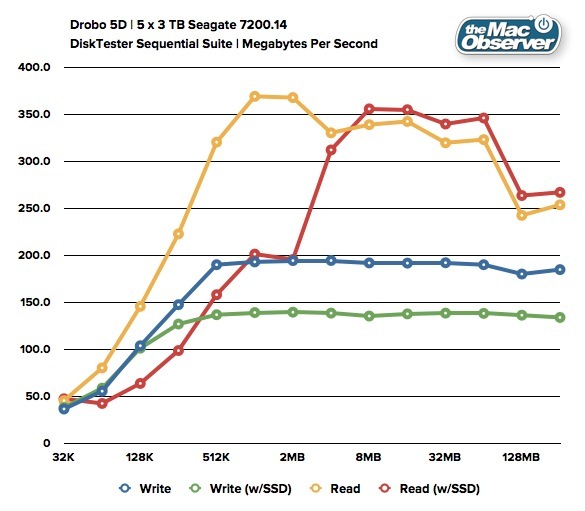 Not everyone will find value in Drobo’s approach to storage, and we can see from the above tests that greater performance is available for those willing to trade the convenience of the Drobo for a more complicated RAID configuration. 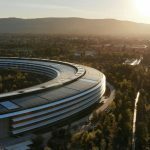 But at the end of the day, most consumers with a need for large redundant storage will find great value in the 5D, especially those with a Thunderbolt-equipped Mac. It is noteworthy here to also point out that the Drobo itself is not a “backup” in the most important sense of the word. The Drobo provides redundancy, which is a crucial step in combining multiple physical drives into a single logical volume, but all of the data on the Drobo is still susceptible to the issues that plague other data storage devices: power surges, house fires, theft, or even data corruption. Therefore, while many people erroneously think of the Drobo as a backup solution in and of itself, it is critical that users keep at least one additional backup of their important data. The 5D, and all Drobos, provide excellent protection in the event of a drive failure, but if something happens to the unit itself, all will be lost. That said, the 5D is an intriguing product with simple setup and excellent performance. As long as proper data protection methods are followed, most users with a need for large external storage will be well suited by Drobo’s latest direct-connection offering. The USB 3.0 speeds do disappoint, but all Mac users should be connected via Thunderbolt. The Drobo 5D is available now from Drobo’s online store and from other retailers such as Amazon. Fastest Drobo yet, includes Thunderbolt and USB 3.0 cables, optional mSATA SSD improves random operation performance, easy to set up and use, nondestructively expandable. 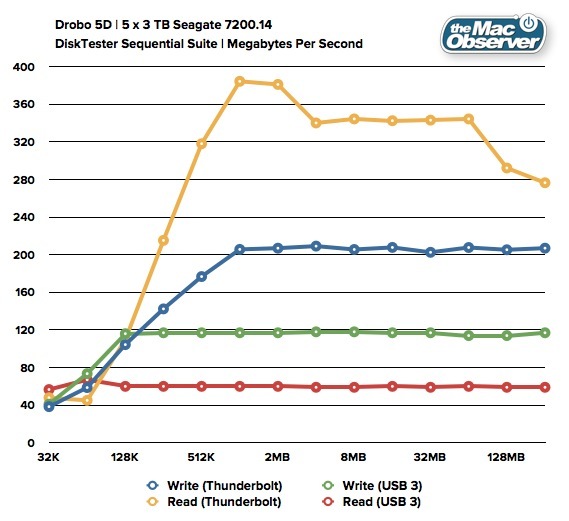 mSATA SSD does not increase performance for many sequential operations, slower than comparable RAID 5 array, USB 3.0 performs significantly slower than Thunderbolt, expensive.